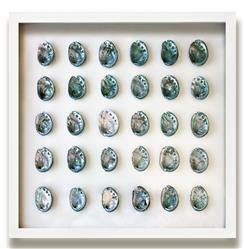 The iridescent shine of abalone shells comes vividly to life when they are mounted and framed in a simple square grouping. Encased in glass on both front and back, the colors of the shells will contrast with the wall it is hung on to create a unique effect. Equally appropriate as a great addition to a zoological or botanical collection wall, or in a nautical style room. This item is made to order, please allow up to 3 weeks for production.